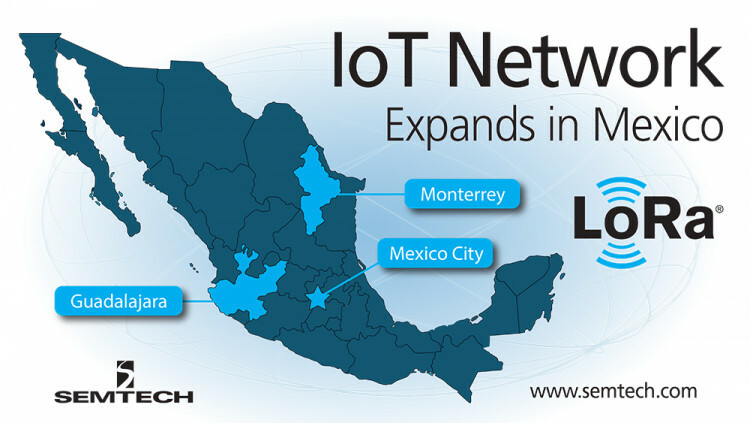 Semtech Corporation (Nasdaq: SMTC), a leading supplier of high performance analog and mixed-signal semiconductors and advanced algorithms, announced that LORIOT and Tangerine Electronics are collaborating on a Low Power Wide Area Network (LPWAN), based on Semtech’s LoRa® devices and wireless RF technology (LoRa Technology), in Mexico. The network, based on the LoRaWAN™ protocol, is expected to be deployed nationwide and Tangerine Electronics will host an on-premise LORIOT server in Mexico City to provide citizens with reliable and secure Internet of Things (IoT) connectivity. Tangerine Electronics pioneered the deployment of LoRaWAN in three major cities – Mexico City, Guadalajara and Monterrey. The full carrier-class services is expected to be available by the end of September 2017 and more cities are expected to be available in late-2017 including Puebla, Veracruz, Chihuahua, and Queretaro. Semtech, Tangerine Electronics and LORIOT are members of the LoRa Alliance™. LORIOT, headquartered in Switzerland and offices in Valencia, Budapest and Tel-Aviv, is one of the worldwide leading and fastest growing IoT LPWA software, solution providers. LORIOT is one of the most reliable, secure and especially user friendly platform for small to large industrial grade LoRaWAN deployments around the world. Our geographically distributed LoRaWAN Cloud and network is providing low-latency access to r gateways at frequency pan, back-ends and users world-wide. Since beginning of 2015, it has been delivering convincing, responsive IoT projects to our customers in more than 100 countries. It has significantly reduced their development effort and shortened time to market. For IoT network deployment, software is available as a managed or unmanaged service on LORIOT’s infrastructure, or can be licensed for a private Cloud or bare metal servers. Tangerine Electronics, a Mexico and U.S. based company, is one of the most innovative carriers in Mexico. Starting in 2007, Tangerine received authorization from the Mexican authority (IFT) to operate as a public telecommunication service provider. Among the main public services, Tangerine operates a “state of the art” HTS Satellite Teleport in Mexico City delivering true satellite broadband connectivity to remote areas in the country. In early 2017, Tangerine received further authorizations that allows the company to operate as an MVNO (Mobile Virtual Network Operator for Cellular systems), and also to deliver wireless and terrestrial links, including telephony and data services. All statements contained herein that are not statements of historical fact, including statements that use the words “will,” “expected to,” “is becoming,” “designed to,” or other similar words or expressions, that describe Semtech Corporation’s or its management’s future plans, objectives or goals are “forward-looking statements” and are made pursuant to the Safe-Harbor provisions of the Private Securities Litigation Reform Act of 1995, as amended. Such forward-looking statements involve known and unknown risks, uncertainties and other factors that could cause the actual results of Semtech Corporation to be materially different from the historical results and/or from any future results or outcomes expressed or implied by such forward-looking statements. Such factors are further addressed in Semtech Corporation’s annual and quarterly reports, and in other documents or reports, filed with the Securities and Exchange Commission (www.sec.gov) including, without limitation, information under the captions “Management’s Discussion and Analysis of Financial Condition and Results of Operations” and “Risk Factors.” Semtech Corporation assumes no obligation to update any forward-looking statements in order to reflect events or circumstances that may arise after the date of this release, except as required by law. Semtech, the Semtech logo, and LoRa are registered trademarks or service marks, and LoRaWAN is a trademark or service mark, of Semtech Corporation or its affiliates.